From Shane Warne and Brad Hogg to MS Dhoni and Yuzvendra Chahal, Kuldeep Yadav has had an assortment of teachers to look up to. Sandip G on the chinaman who after his fiver at Sydney is being called India's most exciting and fastest improving all-format bowler. “Bhaiya, hawa kis side ki hai?” R Ashwin was puzzled by this query from Kuldeep Yadav, who had run out with refreshments during the drinks break of the opening India-Australia Test last year. Kuldeep wasn’t playing that game but he was chalking out the entrapment script and thus factoring in the variables like breeze. “It’s the way I always watch games when I’m not playing. Physically I might not be there, but mentally I am there, bowling uninterrupted for the entire day, fully switched on and aware,” he says. It’s been more than two months since that Test but those memories are fresh in the mind of the chinaman bowler, who is now preparing for the ODI series against Australia. Australian skipper Tim Paine would attest. During the final Test in Sydney, when Kuldeep finally got a chance to be in playing XI, he was ready. Those long hours of strategising while in the dressing room had paid off. Kuldeep had Paine’s stumps disarrayed by a delivery that turned like a top. New age broadcasting tools used to measure the turn of the ball showed a staggering reading: 9.9 degree. “Bahut maza aya uska wicket le ke,” says Kuldeep, giggling with school-boyish joy. It wasn’t the turn that excited him, but the precise execution of a plan hatched long ago. “It was exactly how I had dismissed him in Adelaide,” he says. In his mind. So every time, he came to bat, in Adelaide, Perth and Melbourne, he would imagine setting him up with that delivery. And when the opportunity knocked in Sydney, the dream played out as a reality. All it required was seven deliveries — the seventh, a classical chinaman delivery, one that hung for an eternity in the air, then dipped alarmingly and barged through the enormous space between his bat and pad. Then that’s the visual trickery of flight and dip. Happy as Kuldeep was, he also felt a touch deficient, because Paine fell for the bait all too easily, just when the kick of out-thinking a batsman was kicking in. “The more you work on dismissing a batsman, the happier you get. Of course, you don’t want to dismiss him after he plunders hundred runs off your bowling, but the biggest thrill of spin bowling is about out-thinking a quality batsman. Yeh dimag wala khel hai!” he chuckles. A batsman would decipher variations from the spinner's hand, watching his wrist and the seam position. But Kuldeep can, with the same release, make the ball break in opposite directions. Here's how he does it. Scrambled seam: Batsmen assess whether it's a chinaman or wrong'un by watching the seam. Left-arm wrist spinners bowl seam up for their stock deliveries, the one that's turning in, while resorting to scrambled seam for the googly. It's mostly because the googly is usually released from the back of the hand. So a cross-seam gives you better control. But Kuldeep can do both with a scrambled seam. Side-of-the-hand googly: Usually, the chinaman will come from the side of the hand and the wrong’un from the back of the hand. Again, it's for a better grip — the top joints of the index and middle fingers is across the seam, with the ball resting between a bent third finger and the thumb. But Kuldeep can propel both from side of the hand, leaving the batsman with only two options — to wait for the ball to turn, a dangerous proposition with the amount of turn he can generate, or smother it on the half-volley. The latter ploy is equally dangerous with his mastery of flight and dip. No exaggerated movement: Another way batsmen read a spinner is by watching the exertion of wrists,the snap at release gets snappier. Bowlers turn their wrists around further when they bowl the googlies to get that whip, but not with Kuldeep, whose wrist movements have subtle differences. 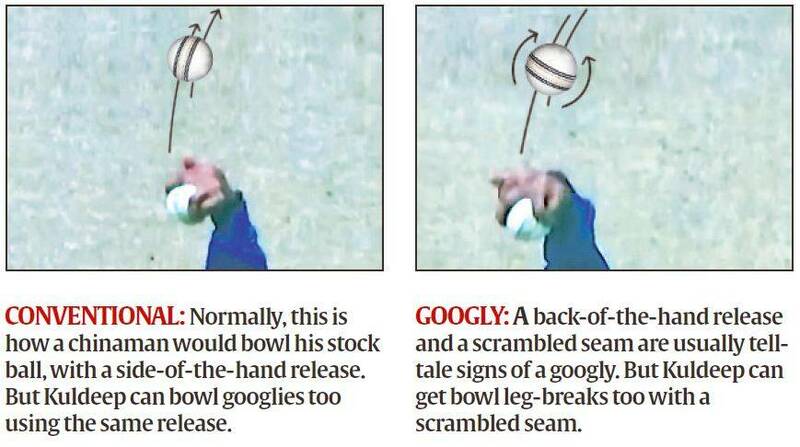 The reason is when he bowls the googlies, he bowls with just one finger on top of the ball. If Ashwin nailed a right-handed batsman with his doosra, Kuldeep would be thinking from a different tangent. “My wrong’un spins a lot, so the batsman, if he picks it, can leave or even cut, while Ash bhai’s doosra turns just that much to take his outside edge. I would rather try a flipper and get him lbw,” he says. It’s also a facade, he says, that hides his fears and doubts. “I’m somebody who likes to feel pressure, so I put myself under pressure before matches. Before every match, I imagine that I’m making debut, getting hammered by the batsman or not getting any overs to bowl. Pressure always perks me up, you are always focused and aware, the mind hardly drifts. You can’t sit back on the five-for you’d picked in the last match,” he says. But at the same time, he can’t show pressure. So the smile. The only time he couldn’t muster the smile to hide his inner turmoil was soon after the India-England Lord’s Test last summer. He was in the playing XI of a Test after nearly a year and there was pressure on him to do well. The conditions weren’t conducive for spin bowling. Rain and a chilling breeze adding to the woes of the wrist spinner. “I could rarely smile. I saw the world crumbling in front of me, but when I look back now, I realise that everything in life has a purpose. The Lord’s Test was an eye-opener, a reality check. I realised I needed to work harder and prepare better so that I wouldn’t repeat the mistakes,” he says. Kuldeep went for 44 runs from his 9 ineffective overs. His first away Test didn’t go the way he had planned. There were a few regrets, one of them was not getting enough overs with the Duke’s balls. So, two days after he returned from England, he brought a box of Kookaburra Test balls — which are used in Australia — and began practising with those. “Much of a spinner’s confidence is about how he grips the ball. You need to get really familiar with it. So whenever I got time I would prepare with the Test balls so that I became as comfortable with it as I am with the SGs. Maybe, it was easier because I have played a lot of limited-over games with the Kookaburra, though the ones used for the Tests are slightly different,” he recollects. In that sense, he is a rare bird than a mysterious, imaginary unicorn, and his craft promises longer longevity than a mystery-spin peddler. The latter’s career has a gimmicky, predictable arc — a sensational entry, fancy deliveries and an absolute disappearance in the subsequent months. Like Ajanta Mendis, who once had the world ’s most fabled middle-order dancing like puppets to the tunes of his carrom-ball flicking index finger, only to slip down the stream of obscurity. Wrist spin, elusive as it may be, is the among the oldest tricks in cricket. Not to drift from the main narrative, the Kuldeep that landed in Australia was a different man, still smiling, but a setback-survivor. In Sydney, he redeemed himself with a five-for (5/99). “Even before the series, I had a hunch that I would play in Sydney. So I would just visualise bowling there and getting those wickets.” He felt a sense of deja vu. And it’s the broadest he has ever smiled and the loudest he had ever laughed. And a smile he says he would struggle to replicate in the future. As Shane Warne strode into the Adelaide Oval for his bit of television-punditry, Kuldeep scampered from the India dressing room to meet him. Catching his breath, he hugged his idol and struck a conversation. The Aussie legend was busy, had to sprint back to the commentary box for his shift, but he couldn’t disappoint one of his wrist-spin brethren either. So he struck a deal. They will meet every day before the match began. He knew he couldn’t oblige every day, but on as many days as possible. So the next day, they met in the tunnel that connected the dressing room and the ground. Kuldeep didn’t waste time. “I wanted to ask him as many as questions about wrist-spin as I could.” The first thing he asked him about was the fizz Warne purchased from the surface. “I could get fizz from dry surfaces, but he would on any surface,” he says, recalling his dilemma. The inexhaustible enthusiasm to learn different facets of his craft, despite the spectacular success, set him apart on the road to greatness. In Adelaide, it was Warne, in Perth it was Hogg, with whom he shares almost a paternal bond. With the records he had racked up since the debut, there’s no doubting the diligence of this bright, disarmingly smiling student of Warne and Co.